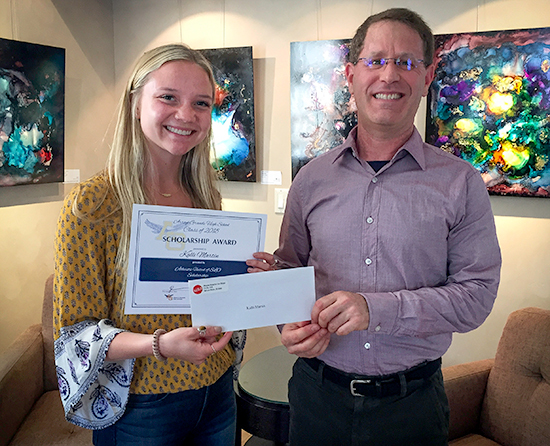 Atheists United SLO is proud to announce this year's winners of a $500 scholarship to two outstanding SLO County high school seniors, Malia Simon and Kalli Martin, both from Arroyo Grande High School. 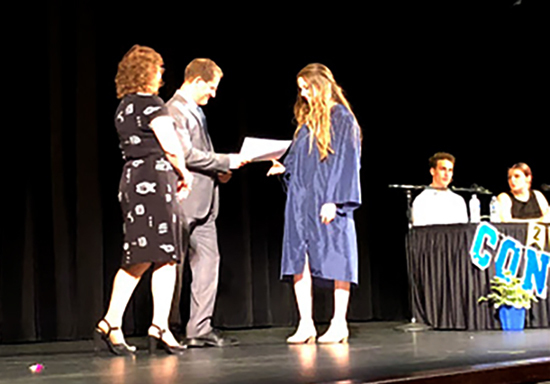 The awards ceremony was held at Arroyo Grande’s Clark Center on June 5th., where AU/SLO President Steve Arkowitz and Vice President, Robin Rinzler presented the scholarships. Atheists United SLO traditionally gives out one scholarship per year, but this year, we were faced with a dilemma. We had two highly-qualified candidates. Because we were unable to choose between these excellent applicants, we decided to choose both women and award two scholarships. The first scholarship goes to Malia Simon, a young woman who was President of the Arroyo Grande high school Philosophy Club, where students critically and rationally examined beliefs about religion, morality, and God. Malia was the founder of the secular Humor & Satire Magazine. She's also published a thought-provoking novel, "Both Hands for Me", which addresses philosophical issues from a secular standpoint. Kalli Martin is our other winner. Kalli wrote a thoughtful and provocative essay for her AP English class about secular versus religious morality. This paper was well-researched and delved into the concept of evolved morality and touched on such issues as religion within the prison population. Kalli was raised in a Christian home, but around the age of 14, embarked on a quest to understand the meaning of religion, and to search for "proof" of existence of God. Kalli now considers herself an atheist. AU/SLO is proud to give our scholarship to both of these young women who have exemplified our values. Congratulations and good luck in your future secular pursuits. On Earth Day April 22nd, team AU/SLO marched with over a thousand San Luis Obispo County residents of all ages to celebrate and defend the vital role that science plays in supporting evidence based public policymaking to help make our planet a safe, prosperous and healthy place. The March For Science SLO at Emerson Park was our local grassroots, non-partisan satellite march in conjunction with the Washington D.C. March For Science. The march joined the efforts of over 600 other marches worldwide including San Francisco, Los Angeles and Santa Barbara. The organizers' goal is to advocate for science communication, funding, policy, literacy and diversity. Festivities continued at the SLO Earth Day Fair at El Chorro Park where AU/SLO participated with an outreach booth. 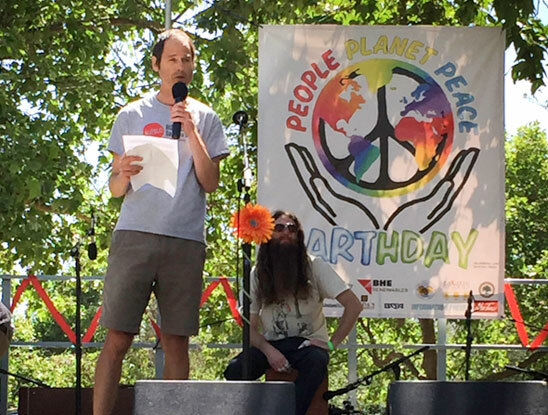 On the main stage, AU/SLO board member Dave Leidner gave an impassioned talk on science and ethics and member Dr. Ray Weymann spoke about what we must do to take action and be involved in combatting human-caused climate change. Big thanks to all who participated and spoke out "Loud & Proud" for science! 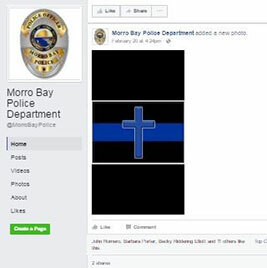 A resident of Morro Bay recently contacted us with concerns about a February 20 posting of a Thin Blue Line Chaplain Cross on the Morro Bay Police Department’s official Facebook page (screenshot attached). The posting immediately follows another about the shooting of two Whittier police officers, one of whom was killed. Atheists United is in full sympathy with MBPD’s support of their fellow officers and shares in the sorrow over this tragedy. Using a cross to symbolize this grief, however, sends an exclusionary message to those of us in the community who are not Christian. One does not have to be Christian to mourn the harm that befalls our brave public servants in the line of duty. We therefore kindly request that you remove the posting of the cross from the MBPD Facebook page. We wish to add that we would fully support the posting of a secular symbol, such as the standard Thin Blue Line emblem. We also request that the city notifies all departments that the display of any specifically religious symbol on municipal property is a violation of both Article XVI, section 5 of the California Constitution and Amendment I of the US Constitution. No matter how well-intentioned, government use of religious symbols unavoidably sends an exclusionary message to those who do not share that religion. We hope you will agree with us that a fundamental function of any government is to represent and protect all of its citizens and that government-sponsored religious displays run counter to this principle. We look forward to your prompt response in this matter. We are pleased to report that the Morro Bay Police Department responded in kind by promptly removing the Thin Blue Line Chaplain Cross from their official Facebook Page in acknowledgment of a letter submitted by AU/SLO. We appreciate the MBPD's respectful response to the request. As a community represented by many different faith groups and beliefs, we can all stand strong together in mourning and showing support to our fallen public servants. Thank you MBPD. 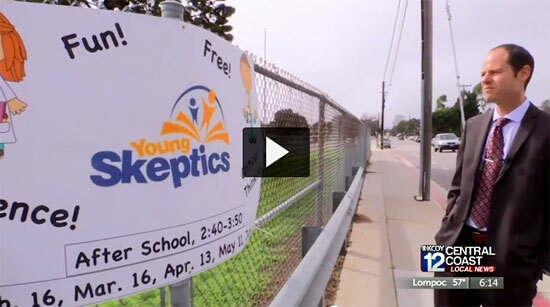 Young Skeptics After School Club Launched! 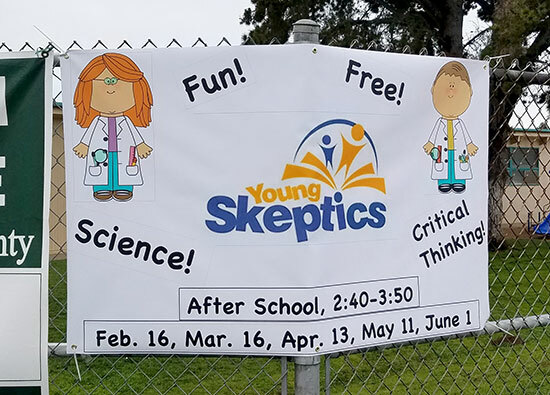 AU/SLO has kickstarted an exciting new after school club called "Young Skeptics" at Harloe Elementary in Arroyo Grande. The foundation of the program is to teach students how to find answers for themselves through critical thinking and evidence based reasoning. Young Skeptics is dedicated to teaching kids how to think rather that what to think by learning problem-solving skills that are essential for a student's future success. The program is FREE and all Harloe Elementary students are welcome to sign up and join! The next meeting is on March 16 from 2:40- 3:50 pm. Please click here for more information and to download a permission slip for your child. One of the ways AU/SLO helps cultivate solidarity within our atheist community is to help give voice to members who are concerned about overt religious encroachment in our community. Please read AU/SLO’s response addressed to Arroyo Grande High School that highlights why the holidays should be about celebrating universal ideals which are inclusive of all members of our community regardless of their religion or lack thereof. We are writing to you on behalf of a concerned AGHS parent who informed us that several of the school's holiday events this year have featured a high proportion of songs with explicitly Christian lyrics. While it is reasonable to include religious music in your holiday events, the program should be appropriately balanced. The Freedom From Religion Foundation notes that it is illegal for schools to sponsor functions that are devotional, proselytizing or religiously coercive (https://ffrf.org/faq/state- church/item/14027-religious-music-in-public-schools). They also provide guidelines for selecting appropriate repertoires. We hope you can remind your teachers, especially around holiday times, that not all of your students are Christian. Some adhere to other faiths and some to no religion at all. For many, holidays are about universal virtues like celebrating community and caring for others, activities that you don't need to be religious to cherish. The more you can focus on the shared ideals behind a holiday and less about its particular religious associations, the more it can be an event all of your students can celebrate. We thank you for your consideration in this matter and wish you a happy and benevolent holiday season. 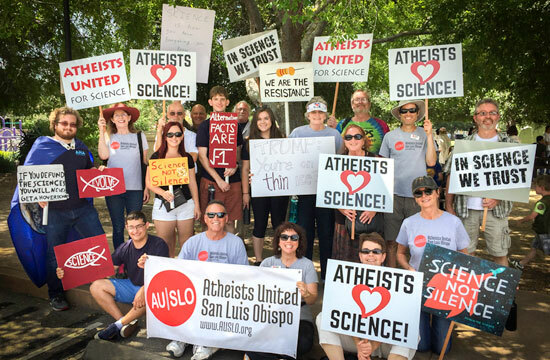 Atheists United SLO is a local nonpartisan organization dedicated to the separation of church and state and to defending anyone in our community threatened by religious intolerance. The words and deeds of President-elect Donald Trump during his campaign have caused concern among millions of Americans who value the separation of government from religion. From policies targeting religious minorities, to selecting a vice president opposed to gay rights on religious grounds, to pledges to appoint Supreme Court justices who would set back the rights of women under the guise of “religious liberty,” Mr. Trump is at odds with the majority of Americans and with true religious freedom. To anyone whose status as an equal member of our community is threatened by religious discrimination, know this: Atheists United stands with you. 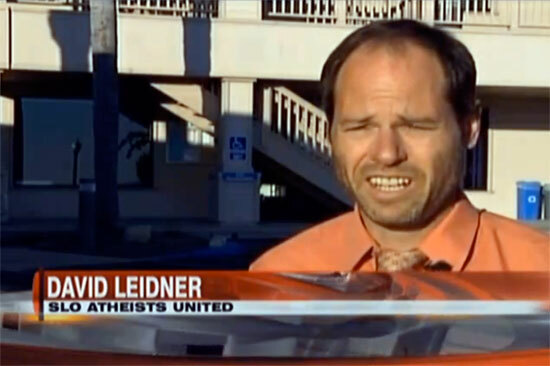 Additionally, Leidner's letter was picked up on the Patheos Friendly Atheist website. David Leidner, head of AUSLO’s CAT (Community Action Team) delivered this month’s atheist public comment at the Pismo Beach City Council Meeting. Thank you Dave for once again rallying and getting-out the secular message to our community to celebrate the role of critical thinking, science and reason in the move toward progress through history. Good evening madam mayor and esteemed council members. My name is David Leidner. I’m a board member of Atheists United San Luis Obispo, a local community organization with over 475 members, among them residents of Pismo Beach. Yesterday marked the 71st anniversary of D-Day, when allied troops invaded the coast of Normandy and began the liberation of Nazi-occupied Northern Europe. It was and still is the largest seaborne invasion in history and would not have been possible were it not for the contributions of many brilliant scientists and engineers. Special tanks, portable harbors, weather forecasting, RADAR– all of these were critical elements in the success of the invasion and all were the product of the scientific method. Over and over, history reminds us just how important the use of evidence and critical thinking is. How much it can benefit us, often in ways we cannot foresee. May the city council always keep this in mind as they endeavor to make the best decisions possible for Pismo Beach. 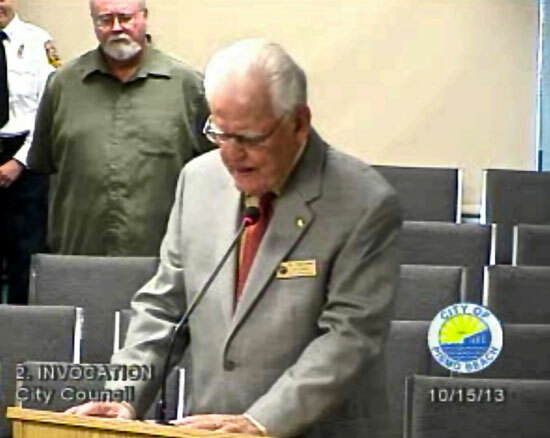 AUSLO, CAT (Community Action Team) member, and Atascadero resident Dan Feldman delivered this month's secular message at Atascadero’s City Council Meeting and reiterates how science and reason play a meaningful role in the success and prosperity of our community and industry. Thank you Dan for being a good ambassador and getting the positive atheist message out to our community. Good evening Mr. Mayor and esteemed council members. My name is Dan Feldman. 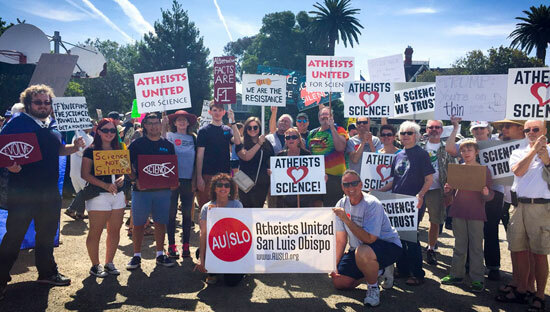 I'm a member of Atheists United San Luis Obispo, a local organization with over 450 members, including those who live and work in Atascadero, such as myself. On this day in 1869, the transcontinental railroad was completed, making the transportation of people and goods across our nation quicker, cheaper, and safer. New towns sprung up and the economy of the West blossomed. The steam locomotives on this railway were made possible by an innovation by James Watt, a Scottish inventor and engineer who had a deep understanding and appreciation for the scientific method. Watt's application of science to the real world contributed immensely to the well-being of countless others. Let us follow James Watts' example, using evidence and reason to govern well and promote the welfare of our fair city. Reason and logic get another ‘shout out’ in SLO County as David Leidner, trusty spokesperson of AUSLO’s Community Action Team (CAT), delivered this month’s invocation at Paso Robles City Council meeting and turns to a meaningful lesson from our founders to highlight how contentious issues can be solved through simple logic. Good evening Mr. Mayor and honorable council members, my name is David Leidner, I’m a board member of Atheists United. We thank you for inviting Atheists United here tonight to give the invocation. AU is proud and honored to be a part of this city's civic affairs. On this day in 1792, George Washington cast the first ever presidential veto. He did it to a bill that would have granted a disproportionate number of congressional seats to some states over others. He was convinced by the arguments of Thomas Jefferson, who suggested that we should instead use a simple mathematical formula. It was a contentious issue at the time, but our nation finally went with the math, a solution that most everyone today accepts as simply logical. This event highlights the fact that given enough careful thinking, there are reasonable ways to solve even the thorniest problems. We get there by looking dispassionately at all the facts, thinking critically, striving for equal treatment for all, and not holding ourselves to old rules or traditions when they are no longer appropriate. Let us all keep these principles in mind as we work together to govern Paso Robles as best we can. AUSLO Community Action Team (CAT) leader David Leidner spoke during public comment at Pismo Beach City Council to once again demonstrate how science and reason pave the way to real progress and discovery in the world. Thanks Dave for acknowledging a key astronomical discovery and the scientists who got us there. Good evening Madam Mayor and honorable council members. My name is David Leidner. I’m a board member of Atheists United, San Luis Obispo, a local community organization with over 450 members, including people who live and work in Pismo Beach. On September 14, 2015, two new astronomical detectors, one in Livingston, Louisiana, and one in Hanford, Washington measured ripples in the fabric of spacetime – gravitational waves – arriving at the Earth from a cataclysmic event in the distant universe. This discovery was the culmination of decades of research by thousands of scientists and proves a prediction made 100 years ago by Einstein. More excitingly, it marks the beginning of a new era of gravitational wave astronomy – the possibilities are as rich and boundless as they have been with light-based astronomy. This leap forward was made possible by government support for science. Most immediate was the funding from the National Science Foundation, a federal government agency. But if we look back further, we have to also credit our local governments and their support for good science education. Surely many of the scientists involved in this discovery could credit a high school, middle school, or elementary school teacher with kindling their scientific curiosity. Developing an appreciation for and understanding of science must be an integral part of every one’s schooling, from kindergarten on. Witholding or obscuring the methods and discoveries of science is only hurting our students, who are growing up in a world where the scientific method is becoming ever more important to our general welfare. And so I appeal to this council to support science education wherever and whenever it can. The payoff to our community and to our world could be astronomical." Dr. Paul Rinzler, AUSLO board member, Cal Poly Professor of Music and Co-advisor of Cal Poly’s Alliance of Happy Atheists (AHA), debated this year against Dr. Ian Hutchinson (MIT Professor of Nuclear Science) at the annual Veritas Forum. The Forum was held at Cal Poly’s Harmon Hall in the Performing Arts Center to a standing-room only crowd. Dr. Rinzler represented the Atheist and hard-science position on the topic of “Can Science Explain Everything: An Atheist and a Christian discuss Scientism”. Veritas is a national organization that sponsors University forums across the nation with their mission of engaging university students and faculty in discussions about life’s hardest questions and the relevance of Jesus Christ to all of life. Many thanks to Dr. Rinzler for being a gracious participant in this year’s forum and defending atheism and reason through the sound approach of critical thinking and the scientific method. Thank you to AUSLO Board Member David Leidner for delivering this month’s invocation before the Paso Robles City Council and paying tribute to one of America’s largely unknown but much appreciated scientists. This story is an inspiring reminder to our community of how the scientific method is one of our best tools to help improve society and becomes a great equalizer to the truth. Good evening Mr. Mayor and esteemed council members. My name is David Leidner. I'm a board member of Atheists United San Luis Obispo. Thank you for the opportunity to give tonight's invocation. On this day 73 years ago, we lost a great American, George Washington Carver. Born into slavery, Carver ended his life with a master's degree in botany and world renown as an inventor and scientist, having developed, among other things, methods of crop rotation that greatly improved yields for American farmers. What was it that enabled Mr. Carver to rise from surely the most disadvantaged position in society to such prominence? It was that he dedicated his intellect to the scientific method. The very nature of the scientific method ensured that Carver's voluminous experimental evidence could not be disqualified because of his race or rank. It had to be looked at objectively. The scientific method is the great equalizer. Properly applied, it leads to the truth no matter who employs it or why. It works the same for everyone, everywhere. And it is available to us all. Even here in this room. So as always, we ask the city council to strive to consider every issue objectively, examining the evidence rationally and critically, keeping our biases in check. This, we believe, is the key to effective governance. Board member David Leidner spoke during public comment at Tuesday night’s Atascadero City Council, offering sage words of advise in light of the recent tragedy in San Bernardino. Thanks David for getting the secular message of tolerance out to our community. Good evening Mr. Mayor and council members. My name is David Leidner. I’m a board member of Atheists United, San Luis Obispo. We’re a local community of 400 non-believers in this county, including Atascadero. As a consequence of last week’s shootings in San Bernadino, calls have been made to treat an entire class of people with greater scrutiny and restriction, simply because they are Muslim. This is a disturbing example of the discrimination that Atheists United has always opposed. No government, national or local, should treat anyone differently based on their affiliation with a specific religion, or their affiliation with no religion. This goes from excluding Muslims at our borders to giving special legal exemptions to religious groups, to displaying “In God We Trust” on our government property. Just as there are moral Christians in this city, there are also moral Muslims, and moral Atheists. And other moral citizens who are none of these. Atheists United asks the council to help ensure that this is not forgotten in Atascadero and to work to create an environment where no particular religious affiliation or non-affiliation is given any special privilege or sanction. Board member Kim McGrew authored and delivered a thoughtful secular invocation at the Paso Robles City Council meeting which took place October 20th. The invocation encourages a message of inclusion within the community and also to council members as they deliberate City business. Thank you Kim for getting the positive secular message out! Good evening. Please be seated. Thank you, Mayor, and council members for inviting me back to provide the invocation for this city council meeting. My name is Kim McGrew and I am on the Board of Directors of Atheists United, SLO County. For tonight’s invocation, I come with a simple request for you to consider - and that is the principle of inclusion. As you gather here today to see to the business of our city, I ask you to consider the diverse population of Paso Robles, which is a very diverse community with many different views and opinions. We embrace many traditions and represent many demographics. We are Christians, Jews, Muslims, Hindus, Buddhists, humanists, atheists, agnostics, Wiccans, pagans, unaffiliated, uncertain and so many other things. We are young and old and everything in between. We represent many races and nationalities. We identify as libertarian, liberal, progressive and conservative. When we work together to move our community forward in a spirit of mutual respect and common decency, we showcase what is best about our community, our state and our nation. As Aristotle said over 2,000 years ago, the whole is greater than the sum of its parts. Our community is made stronger by the presence of different cultures, traditions and viewpoints. The freedom each of us enjoys to follow our own spiritual path with no government interference, established by our constitution over 200 years ago, has served as a shining example for the rest of the world and has contributed to the astonishing success of our nation. This is the principle of inclusion. Reason, science, and experience have shown that we, as humans, can meet the challenges of these differences to create a society with less dissension and leave a better, more equal culture for future generations. In order to achieve the greatest good for our community, it is important for us to keep an open mind, and to honor and respect the human rights of each other. We should consider the benefit provided by differing perspectives, and be willing to question old assumptions that only obstruct our path to progress. It is my hope that we challenge ourselves and others to improve our quality of life. And so, I ask you to consider our common humanity and the principle of inclusion as you deliberate tonight. 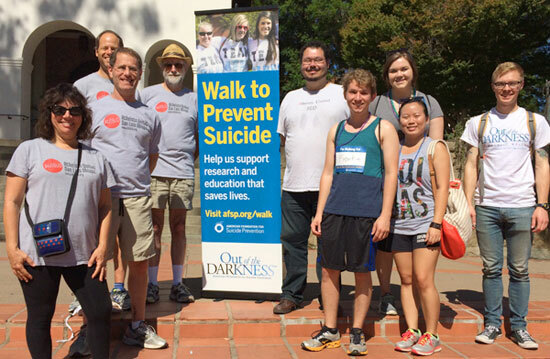 Team AU/SLO walked in the “Out of the Darkness” Community walk in downtown San Luis Obispo this morning with 1000s of other people nationwide to help raise money and awareness for the American Foundation for Suicide (AFSP) raising $285. The American Foundation for Suicide Prevention is at the forefront of research, education and prevention initiatives designed to reduce loss of life from suicide. With more than 39,000 lives lost each year in the U.S. and over one million worldwide, the importance of AFSP’s mission has never been greater, nor our work there urgent. Donations through this year are still being accepted at their website. Thanks team for getting your monkey shoes on and walking for an important cause! 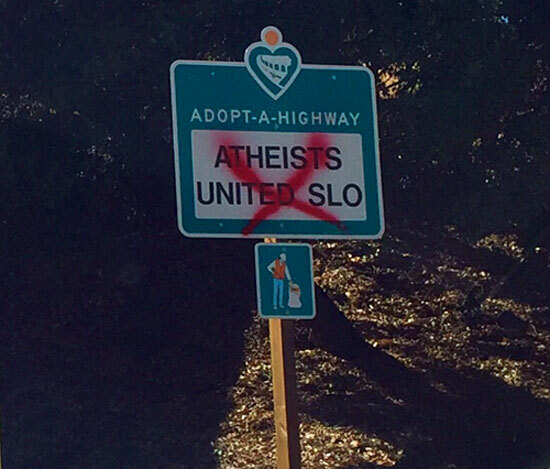 Travelers on southbound Highway 101 near Atascadero, California noticed this morning that the Atheists United San Luis Obispo (AU SLO) highway cleanup sign had been vandalized. "AU SLO stands for reason, compassion, and tolerance for all people," said AU SLO president Steven Arkowitz. "The highway sign is a symbol of the positive work we are dedicated to performing in our local community." AU SLO is a local nonprofit organization representing over 400 non-believers in San Luis Obispo County. The City of Atascadero invited AUSLO to participate in their "Patriotic's Day of Lighting of Historic City Hall" ceremony held on Sept. 11th to commemorate local and national heroes as well as to celebrate the new lighting of Atascadero's City Hall. AUSLO President Steve Arkowitz delivered a heartfelt & inclusive speech that was warmly welcomed by attendees with a generous applause. Thank you Steve for a job well done and taking the time to represent us so nicely in the community. Good evening. My name is Steve Arkowitz and I’m the president of Atheists United San Luis Obispo, and I’m pleased and honored to be a part of this ceremony. We are gathered tonight as a community, to honor those who have worked and sacrificed in support of the idea that all people deserve to be treated with respect and dignity. These brave men and women have defended the rights of all of our citizens and residents. They have risked much, and sometimes paid a heavy price in service to our local community, our country, and the world at large. As a recent example of this bravery, I only needed to look out my front door where I could see the Cuesta fire burning. I was humbled knowing that there were over 1000 firefighters from all over state, working around the clock, risking their lives to keep our community safe. No matter your race or nationality; regardless of whether you are religious or non- religious; rich or poor; we can all understand or imagine what it would be like to need help in a life-or-death situation, and how grateful we'd be if we received such help in a time of need. In the face of challenges and adversities, we can gain strength from one another through our reason, understanding and empathy. We have to remember that we have much more in common with one another than we have differences. I would like to ask that we take a moment to remember all the men and women who have given their lives trying to make our lives better, and recognize those who continue to do so. We honor their compassion and their dedication to helping others and we thank them for their service. Atheists United SLO member Nick Verhage delivered some ‘righteous’ secular remarks at the July 8th City Council Meeting. The invocation was beautifully authored by board member David Leidner. Thank you Nick & David for a job well done and for your commitment to promoting reason & secularism in our community. Good evening Mr. Mayor and esteemed council members. My name is Nick Verhage. I'm a member of Atheists United, San Luis Obispo and I thank you for affording us the opportunity to give this evening's invocation. This past Saturday, we celebrated the Fourth of July, the day the Continental Congress declared independence from the British Empire. Their declaration contained the fundamental, and to some shocking, statement, "We hold these truths to be self-evident, that all men are created equal..." It is noteworthy that the rough draft used the words "sacred and undeniable", but they were changed to "self-evident" to reflect our founders' commitment to using evidence and reason to determine moral values. Indeed, the Supreme Court upheld this principle last week when they overruled tradition and extended the right to marry to all of our nation's citizens. As we make our own decisions about right and wrong, in this room and elsewhere, let us also cleave to evidence and reason. They are, hands down, the best guides we have for arriving at truly righteous decisions. Hi, I’m Paul Rinzler from Atheists United, a local organization representing over 375 non-believers in San Luis Obispo county. Yesterday was Memorial Day, the day to remember those who died while serving in our armed forces. We would like to note that many of those who died were non-religious. According to the department of defense, 30% of our troops state their religious preference as none, unknown, or atheist. Let us remember, then, that in our country, people of all faiths, and of none, deserve equal consideration and respect. Atheists United San Luis Obispo (AU SLO) awarded the 2015 Humanist Award on Tuesday night to retired astrophysicist Ray Weymann for his outstanding efforts to advance the public understanding of science in our community. The award was part of the Central Coast Coalition of Reason’s Week of Reason, a series of events celebrating secular values. “Ray is truly a scientific beacon in our community, illuminating our understanding of important local and global issues,” said Steve Arkowitz, president of AU SLO. Dr. Weymann received his PhD in astrophysics from Princeton University and has 40 years experience in teaching and research. His research interests have varied from the history of the early expanding universe to the atmospheres of stars, and combined calculations and observations with some of the world's most powerful telescopes, including the Hubble Space Telescope. Since retiring and moving to Atascadero in 2003, his interests have turned to public education about science especially concerning climate science and global warming. He has given dozens of talks to both students in science classes and adult groups with many backgrounds and has a website on climate science: centralcoastclimatescience.org. “I think Atheists United has a very important role to play in society. By combining reason and compassion we will have a very constructive and important impact,” said Weymann in accepting the award. The Week of Reason coincides with the National Day of Reason on May 7, a secular alternative to the National Day of Prayer on the same day. Responding to complaints organized by Atheists United San Luis Obispo (AU SLO), the Principal of Arroyo Grande High School (AGHS) says he will put an end to the teaching of creationism in a school science class. The school district also responded that they will investigate the matter. AU SLO was contacted last week by a concerned mother of an AGHS student who reported that her son was being taught creationism in a life science class. This past Monday, AU SLO sent a letter of complaint to AGHS Principal Conan Bowers and also reached out to the Freedom From Religion Foundation (FFRF) which sent a letter on Wednesday to Lucia Mar Unified School District Superintendent Jim Hogeboom. In response, Mr. Bowers contacted the student's father yesterday and told him that he was unaware that creationism was being taught at AGHS and that he would put a stop to it. School district Assistant Superintendent Chuck Fiorentino also wrote to FFRF that they wouldinvestigatethematter. Accordingtothestudent,theteacher,whohadbeen talking about creationism daily for the past week, made no mention of creationism in class yesterday and rescinded an assignment requiring students to write an essay comparingcreationismandevolution. Asofyesterdayevening,theteacher'snameno longer appeared on the AGHS website staff directory or as a teacher for any classes listed on the AGHS science department page. "This isn't an anti-religious stance, this is about my son learning science," says the mother. "My son has been upset and frustrated about this since day one. He loves school but he hasn't wanted to be in this class." According to the mother, the teacher had been discussing creationism as an alternative to evolution and recently devoted three days of class time to watching the Bill Nye – Ken Ham debate "Is Creation A Viable Model of Origins?" and had students summarize a pro-creationist blog posting as homework. The teacher also showed a slideshow entitled "Creation versus Evolution" that covered the arguments for and against creationism and had posted an offer of extra credit for students who write an essay on creation versus evolution on the class website. The student's father wrote an email to the teacher objecting to the teaching of creationism. In his reply, the teacher stated "I feel it would be a disservice to my students not to present both sides of the argument." "Saying there are two sides to the theory of evolution is like saying there are two sides to the theory of gravity," says AU SLO board member, David Leidner. "Even our federal courts have ruled that creationism is a religious belief and not a scientific theory. It doesn't belong in our public schools." The Supreme Court struck down teaching "scientific creationism" in public schools in 1987 (Edwards v. Aguillard) and in 2005, a federal court ruled that creationism and intelligent design were religious views and did not qualify as scientific theories (Kitzmiller v. Dover Area Sch. Dist.). Federal courts have also upheld the right of schools to prohibit teaching creationism (Peloza v. Capistrano Unified Sch. Dist.,1994; Webster v. New Lenox Sch. Dist. No. 122, 1990) and have struck down laws requiring schools to teach creationism (McLean v. Ark. Bd. of Educ., 1982). "AU SLO applauds Principal Bowers for committing to put a stop to the teaching of creationism at AGHS and we look forward to seeing him follow through. We hope this serves as a reminder to all schools in our community that our children deserve to learn real science," says Leidner. Atheists United San Luis Obispo is a non-profit community organization representing 375 members county-wide. For more information, visit www.AUSLO.org. My name is Kim McGrew and I am a board member of Atheists United, San Luis Obispo. Today is the birthday of Kenneth Page Oakley, an English scientist who developed a method to date fossils by measuring their fluoride levels. Oakley is most famous for using his method to prove that a famous skull claimed to be from a mysterious and ancient human ancestor was actually not very old at all. Many people wanted the skull to be special and so, for over forty years, they suspended their critical thinking and accepted this story of the Piltdown Man. Only after Oakley applied the scientific method did the scales fall from their eyes. If we want to know the truth of any matter and make the best decisions we can, we must set aside what we want to be true, and what we've always thought to be true, in favor of what evidence and critical thinking tell us to be true. We call this the scientific method and striving to apply it in our public and private lives is one of the noblest things we can do for ourselves and for others. 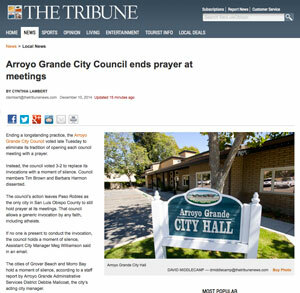 The Arroyo Grande City Council voted 3 to 2 last night to end invocations at city council meetings and replace them with a moment of silence. The vote came after public comments by members of Atheists United, San Luis Obispo (AU- SLO), a number of whom were residents of Arroyo Grande. AU/SLO board member David Leidner told the council that they had a "golden opportunity to ensure fairness" by ending all invocations. "This is the best option not because it favors our interests or anyone else's," he said, "but because it does just the opposite. It is the most neutral and inclusive position to take." The city council's reconsideration of their existing invocation policy was sparked by a request from AU/SLO to start giving invocations at Arroyo Grande city council meetings. AU/SLO's request was in response to the Supreme Court's recent ruling allowing sectarian invocations at government meetings. Voting in favor of replacing invocations with a moment of silence were Mayor Hill, Mayor Pro-Tem Barneich, and Councilman Guthrie. They said they wanted to avoid the complication of trying to accommodate all invocation requests and the risk of alienating or offending meeting attendees. Voting in opposition to the change were Council Members Brown and Harmon. The council meeting minutes and video can be viewed at www.arroyogrande.org/AgendaCenter/City- Council-8. Good evening. Please be seated. My name is Kim McGrew, and like many of you in this room, my family has lived here for 4 generations. I'm proud to be a participating member of this community, as I'm sure you are, too. I am also on the Board of Directors of Atheists United, SLO and come with an invocation for reason. Most invocations in this room begin with a request to bow your heads. I would like to ask you not to bow your heads. I would like to ask that you take a moment to look around the room at all of the men and women here working toward improving the lives of the people of our community. Rather than bowing our heads and closing our eyes in deference, we should open our eyes widely to face the reality that confronts us, without losing sight of our ideals of what we could achieve. In this room there are sometimes challenging debates and moments of tension and frustration. But this is also a room where, as the secular humanist tradition stresses, by the very fact of being human, we have much more in common than we have differences. In order to achieve the greatest good for our community, it is important for us to maintain an open mind, and to honor and respect the human rights of each other. We should consider the benefit provided by differing perspectives, and be willing to question assumptions that serve only to obstruct our path to progress. In this room let us celebrate our shared capacity for reason and compassion and our dedication to the people of our community. Let us root the policymaking process in these values that are relevant to all in our community regardless of religious belief or non belief. In the decision making process, please be guided by your knowledge, your experience, your education, and upon sound scientific evidence. We must remember that in the face of adversity we need not look above for answers, but instead recognize the proven potential within ourselves and in each other to overcome any challenges we face. 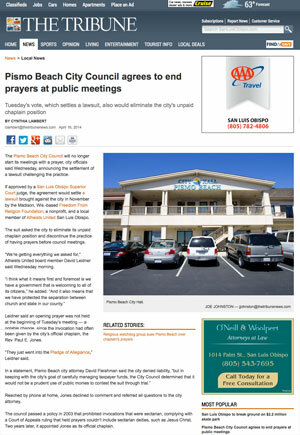 If they haven't already, we hope other governments in our community will follow Pismo Beach's lead and do away with designated time for prayer at their meetings. Public prayer does nothing to aid in governing a town or city; it only serves to alienate and divide its citizens. After a closed session at last night's city council meeting, the City Attorney reported that the Council had voted 3-0 to authorize him to accept a stipulated judgment with the plaintiffs to pay each $1 in nominal damages, discontinue the city chaplaincy, and cease "scheduling, coordinating, inviting, delivering, or otherwise participating in prayers, invocations, or religious rituals at the opening, immediately proceeding, or following, council meetings." City Council members Vardas and Reiss did not attend last night's meeting, at which no invocation was given. "We are very happy the city of Pismo Beach has decided to end this exclusionary and unconstitutional practice and make their government meetings welcoming to all citizens," said David Leidner, AU/SLO board member. The settlement between FFRF and Pismo Beach will be reviewed by San Luis Obispo superior court Judge Martin Tangeman, who is expected to sign it and make it legally binding. Atheists United SLO is a local non-profit organization that aims to create a supportive community for atheists, agnostics, and rationalists in San Luis Obispo County. AU/SLO encourages critical thinking about religion, advocates for the separation of church and state, and strives to demonstrate the positive aspects of atheism. The Pismo Beach City Council begins each meeting with an official Christian prayer. At almost every meeting, everyone is asked to stand while the city-appointed chaplain, a Pentecostal clergyman, leads prayers that espouse a particular brand of Christianity. These prayers call upon "Christ our lord" and "our personal savior", accuse listeners of immorality, and exhort them to obey a particular Christian doctrine. 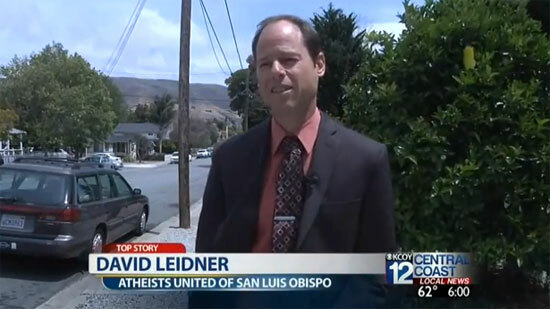 Atheists United SLO (AU/SLO), whose members live, work, and play in Pismo Beach, asked the City Council, in writing and in person, to stop the prayers. Receiving no response, AU/SLO contacted the Freedom From Religion Foundation (FFRF) which also wrote a letter to the City Council asking them to cease the unconstitutional prayers. After receiving no response as well, FFRF filed a lawsuit against the City of Pismo Beach. FFRF v. City of Pismo Beach official complaint. Isn't it legal to have religious invocations at government meetings? The Pismo Beach City Council prayers are an official part of each meeting and are overtly Christian. It is a violation of the California State Constitution for a government to align itself with any religion. The City also maintains an official City Chaplaincy. This also is prohibited by the state constitution. Are the prayers really overtly Christian? 67 "in the name of our personal Savior and Lord"
5 in the name of "Christ our Lord"
1 in his name as "Your Son and our Savior"
6 in the name of Christ the "Redeemer"
1 to "great god our king." Only Christianity was represented in all but one of the prayers. Christian clergymen delivered 123 of the prayers: the City Chaplain, a Pentecostal clergyman, gave 112 prayers and other Christian clergymen gave 11 more. Two prayers given by non-clergy still invoked the Christian god. The sole non-Christian prayer-giver was a Hindu cleric who gave the invocation on October 1, 2013, reading quotes from Hindu scripture and addressing the Hindu god, thus making his prayer just as sectarian as the Christian prayers. The City Chaplain referenced the Bible no less than 88 times, most often referring to it as the "Holy Scripture." But is there any real harm? Every person who has business with the Pismo Beach City Council must first listen to a city-sponsored prayer given by a city-appointed chaplain exhorting citizens to adhere to a particular brand of Christianity. It's not hard to see how this could alienate someone who does not share those beliefs, including Buddhists, Hindus, Jews, Muslims, non-believers, and other Christians, among others. So what is the goal of the lawsuit? The request, which was previously made to the City Council in writing and in person, is simple: stop the official prayers and stop sponsoring a city chaplain. Who is Atheists United SLO and why does this concern them? Atheists United SLO is a meeting place for all atheists, humanists, rationalists, skeptics, doubters, agnostics, and other non-believers to get to know each other, share ideas and build a community of like-minded individuals in San Luis Obispo County. We encourage critical thinking about religion, advocates for the separation of church and state, and strives to demonstrate the positive aspects of atheism. We are dedicated to protecting everyone's right to a government free from religion and oppose any government activity that discriminates against people based on their religious beliefs or non-beliefs. For more information on Atheists United SLO please visit our Meetup site. Who is the Freedom From Religion Foundation and how are they involved? The Freedom From Religion Foundation (www.FFRF.org), a national non-profit IRC 501(c)(3) educational charity that defends the constitutional separation between state and church, and educates the public about the views of non-theists. After being contacted by Atheists United SLO, the Freedom From Religion Foundation wrote a letter to Pismo Beach asking them to stop the prayers. Receiving no response from the City, the Freedom From Religion Foundation filed a lawsuit against the City. To view the official complaint, click here. To view the legal exhibits, click here. To join Atheists United SLO, visit our Meetup site by clicking here. To learn more about the Freedom From Religion Foundation, click here. To download a PDF of these FAQ's, click here.